Ginza subway line has its station high above the ground level. 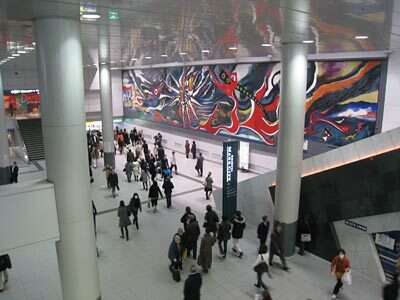 A wall painting by Taro Okamoto was placed recently in the corridor between Inokashira line and Ginza subway line. This photo was taken just in front of the entrance to Markcity. 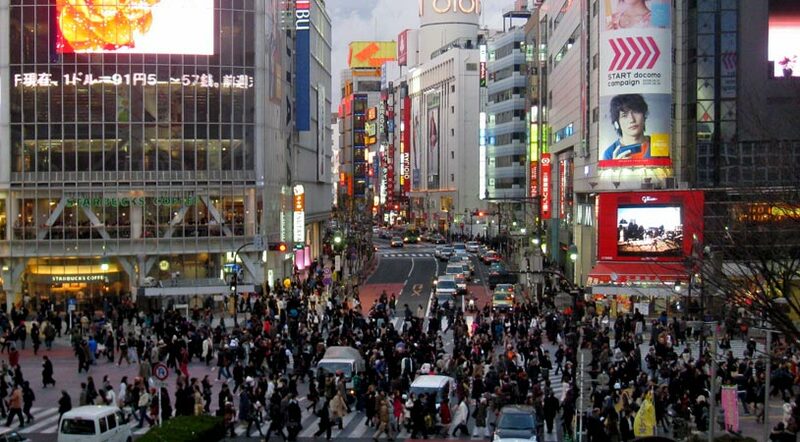 In foreign countries the zebra crossing at Shibuya may be the most famous spot in Tokyo, because this place enbodies the image of busy, chaotic and weird Japan, an exotic civilization. Many photos and videos of the crossing are produced by both Japanese and foreign people and contribute to transforming the abstract idea to a concrete conviction. 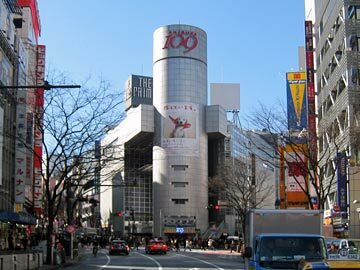 Shibuya is a sub-center of Tokyo. It copmrises a junction of roads and railways and has developed as a major front of youth culture. Compared to other sub-centers of Tokyo such as Shinjuku and Ikebukuro, Shibuya gives an impression of narrower, more chaotic and confused space. I think this impression is created because Shibuya is located at the bottom of a valley. "Ya" of "Shibuya" means valley and the Shibuya quarter was in fact developed in a valley. Now all the rivers are covered by artificial constructions and invisible from the surface, but still exist underneath, for example under Inokashira Street and a Tokyu Department Store. The zebra crossing is located at the bottom of a valley and is the lowest part in the neighborhood. 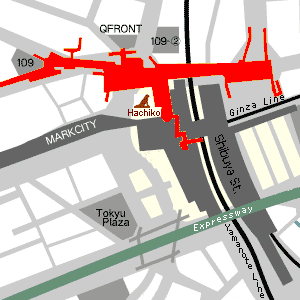 The position of Ginza Subway Line shows that the ground level around Shibuya station is very low. When the train approaches Shibuya, it emerges at the surface and ascends even further. 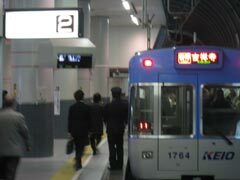 The Shibuya station was constructed at the third-story level of the building. Therefore many roads from the zebra crossing in Shibuya slope upwards. The narrowness and complexity of the road networks are the result of Shibuya's geographical oddity. However, the zebra crossing is not the deepest point of Shibuya. Beneath the crossing there exists an underground shopping area and corridors and these look quite different from the surface level. The area of "Shibuchika" is colored red. "Shibuchika" is the oldest underground shopping area in Japan and opened in December 1957. Even today there are still around thirty privately owned shops and Foodshow, the food division of Tokyu Department Store ( cakes, vegetables and fruits and fish). Like many other traditional shopping areas in Japan, the private shops of Shibuchika look somewhat quaint and outdated ( ). In contrast to life on the ground, the majority of customers in the Shibuchika shops are older women. For the young people on the ground level that so often appears in the media, this area has little to do with Shibuya. It is amazing that exactly underneath the busy crossing - as a symbol of contemporary Japan - such traditional business style still survives. Apart from the Foodshow space, which is managed by big capital, the underground shops do not seem to prosper much. If you go further to other parts of the underground construction, you find many empty places. For example, this part of the corridor is exactly beneath another zebra crossing in front of 109( - Default image is 109.). While the crossing is always crowded with young people wearing crazy fashions, there are only a few people in the underground corridor, though there is direct access to the 109. Likewise, only a few people try to use the underground passage below the famous zebra crossing ( ). Even though people have to hold umbrellas when it rains and have to wait for traffic signals, they seem to prefer ground level. 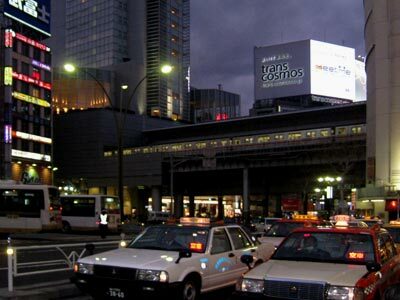 Recently a new mega-project was completed when Markcity opened over Shibuya station of the Inokashira line. I find it a bit odd that once you enter Markcity you can only exit at the end of a corridor thus reaching the upper point of the Dogenzaka slope. This is analogous to the Ginza line and in essence it is a sort of "underground shopping" center, though its entrance was built high above the ground.